Suicide Squad/Banana Splits #1: "Suicide Splits"
“Suicide Splits” pairs up Saturday morning’s animal rock band with Amanda Waller’s Task Force X, the dirtiest players in the game! 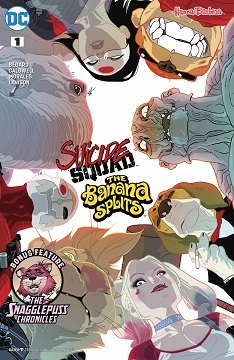 Mistaken for metahumans and thrown into the bowels of Belle Reve Penitentiary, the Banana Splits are recruited by Amanda Waller for a secret mission: Save the Suicide Squad! What follows is quite possibly the weirdest team up ever; how will Fleegle, Bingo, Drooper and Snorky stand up to Harley, Deadshot, Katana and Killer Croc? Mark Russell brings his hilariously satirical style to this backup feature, where Snagglepuss is a Southern gothic playwright working with an ensemble cast of cultural figures, exploring an intensely creative time in the New York City theater scene of the 1950’s. Warning for violence and for sensitive subject matter. 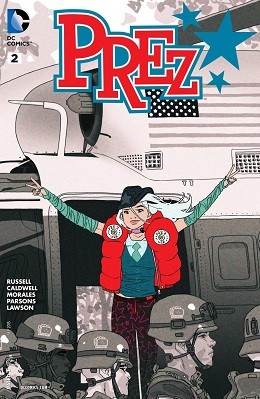 "I wanted to do a very different comic book than the original Prez. 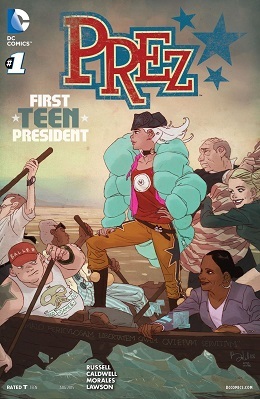 I think that the original Prez was more relevant for the early ’70s–it was about that they thought youth culture was about to take over the world now that 18 year olds could vote, and we’re in very different world now. We’re in a world where youth culture has largely failed, where the government and politics are largely controlled by elites and non-egalitarian forces. So I wanted to do a comic that was about this political reality, and to make that separation as cleanly as possible I wanted to come up with a completely different character in as many ways as possible from the original Prez Rickard. Although, I will say, Prez Rickard does show up as a character in the new Prez: he’s super old, in his 70s, and he’s a failed wunderkind from the past. He did not become president in my world, but he is there. I wanted it to be a very different comic about a very different time in American history." Prez #1 - Tacos for All! "We had an establishment that was leading the country into endless conflicts overseas, that was entrenching economic interests behind corporate elites, and then this youth culture comes up to oppose it. And what we ended up getting was war overseas and entrenched corporate interests, but with a lot better style. So it’s kind of my critique on how the youth movement failed over the last 40 years and what would happen if it actually were to succeed in the future." 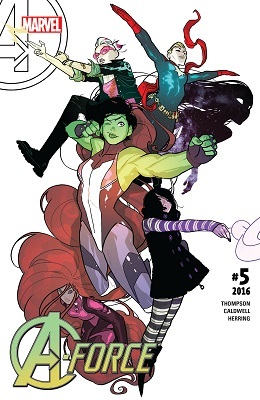 Wednesday Comics 6! Only three weeks late! Yeah, I kind of dropped the ball on the weekly posts, but the scans have so much time between them that my heart went out of it. Dunno whether I'll keep up, but I'm giving up on the showcase-style posts. Instead, here's my two favorite strips from week six. Warning: As those of you who've picked up an issue of Wednesday Comics know, these pages are HUGE. Those with slower connections should keep that in mind. 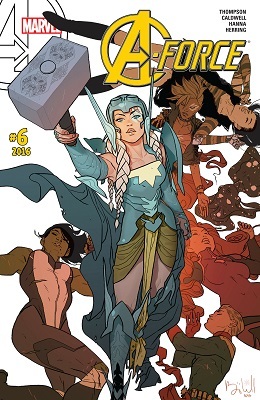 Y'all remember Ben Caldwell, the guy doing the Wonder Woman segment for Wednesday Comics? He's been posting art teases on his blog, and a few weeks back I put some of them up here. He's posted a bit more art, so I've put some new pics up under the cut, but I'd also like to direct anyone who commented on the last post to this thread, in which Caldwell swings by to offer a response to some of our discussion. Partly because internet shelf life dictates that otherwise no one would see it, but mostly because (highlight for spoiler) OMG CHEETAH, which elicits in me a response very similar to the one Gage just got from schmevil and batcookies for his Tigra comment. Ben Caldwell, who's working on the Wondy segment of the upcoming Wednesday Comics weekly, has been posting art teases at his blog. There's some fairly cool stuff and some vague suggestions of plot as well.